They must be two sets of twins. The back of this CDV doesn’t tell us anything about them, but it does identify the photographer, C. W. Gill. I didn’t find anything about Gill online. The Hubbard Block was built on Public Square by Volney Stow Hubbard in 1868, which is about when this photo was taken, I’d guess. Other photographers had studios in the Hubbard Block at various times, but Gill’s must have been one of the first. The studio is completely bare, without a backdrop or rug, which may be an indication that Gill hadn’t been in the building very long. I find the checkerboard floor very appealing, and the plain wall allows our gaze to remain on the sitters. The women in back are holding hands, and each has placed her other hand on the shoulder of the sitter in front of her, suggesting a degree of familiarity. Did these four young people decide to have their picture taken together, or did someone else suggest it? A hint of a smile tells us that at least one of the four was enjoying herself. I’m seeing a family resemblance between the young man and the young women standing behind him (mouth and chin). I’m wondering if he and the young woman seated next to him might be husband and wife. I’m going to stick with my twins theory, but other theories are always helpful! I like that you see them as art more than historical documents, Brad. Without lots of details of who the people are, they sit nicely in the art context. I do see how they could be two sets of twins. The woman, all having the same neck accessories, if not dresses, must all be siblings and the young man would therefore be their brother, I think. I’m going to disagree with Liz (sorry Liz!) and say that even if unrelated by blood to the women, he looks too young to be married to the lady next to him. I would guess him to be only fifteen or sixteen. I know girls sometimes married very young in the Victorian era, but did boys? Thank you for pointing out that the three dresses are the same! That’s an important clue. I’d only noticed that the two in the back were alike. What an intriguing picture! Two sets of twins, four siblings? You may be right! There seems to be broad agreement that they’re all related, although that wasn’t my thinking at first. I would assume the boy is the son of one of the women. For sure they are all related! I think they are all siblings.They all have the same eyebrows then there’s the neck ties (bows) on the similar dresses. The three women (girls? Difficult to tell their ages) are also wearing the same hair clasps and have the same hairstyles. The two at the back probably are twins. To me, all but the girl at the back right look happy – they are all smiling (the front girl smiling with her eyes.) I think the back right girl has just been distracted by something as the photo was taken. As you say, very plain studio setting – no backdrop. Or rather, no painting on the backdrop, there certainly is a backdrop of sorts – you can tell from the uneven gap at the bottom of it – more gap to the right. And a strangely-plain chair. Great observations, Val. “Smiling with her eyes.” I like that!! I looked at the photo in very high resolution, and concluded that the seated girl isn’t wearing a ring. There seems to be a slight flaw in the print in that spot, but it doesn’t look like a ring up close. The two standing women are wearing dark bands, which is interesting. Thanks for pointing that out! I remembered reading this post and the comments, and wondering what were the chances of having triplets. During my visit to Australia, we visited the coastal town, Port Macquarie and their local museum. I came across this picture of a woman with triplets, two boys and one girl, which immediately brought me back to this post and perhaps the twins in your picture could have been triplets. What an interesting thought. 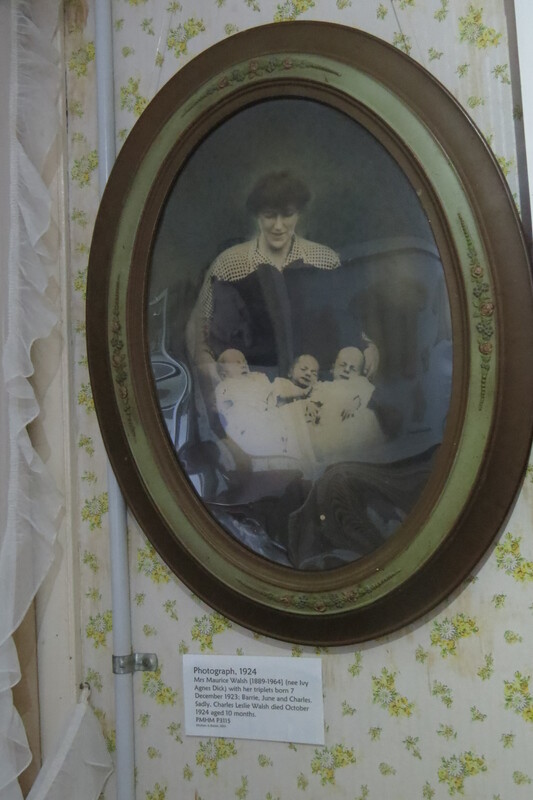 Reading the card under the portrait in your photo, I can’t help but wonder how much the surviving twins, Barry and June, thought about their deceased twin, Charles, during the course of their lives. Thank you for taking and sharing your photo! Lin, you’re the only person I know who knows how to insert photos into comments. I’m sure a lot of bloggers would like to know how to do that. Do you upload the photo as an unattached media file on your blog and then copy the link into the comment box on someone else’s blog? Yes, it is what I did exactly, although sometimes it doesn’t show up directly in the comments as a picture but a link instead. Not sure if it also depends on the setting of the blog I’m commenting on.